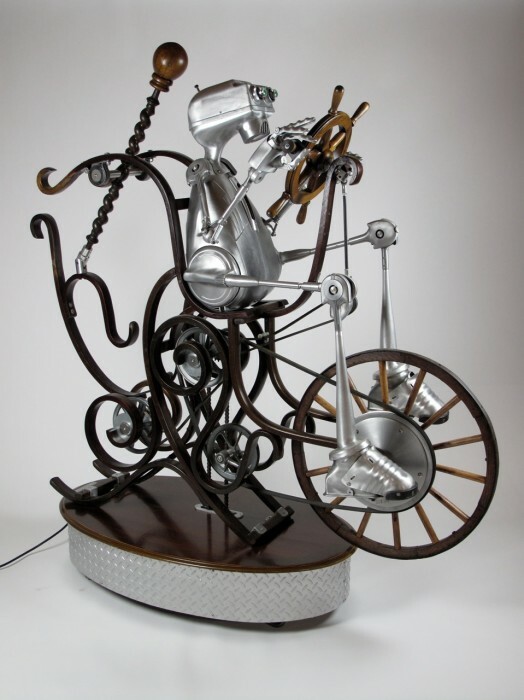 This sculpture was made mainly from materials salvaged at Urban Ore by Bay Area artist Nemo Gould. Artists from all over the Bay Area flock to Urban Ore not only for materials, but for inspiration as well. Take Nemo Gould for example. We frequently see Nemo wandering the aisles of Urban Ore looking for that next crucial piece to complete a current project, or to spark the idea for something new. He built this piece, entitled Nowhere Fast, using materials found at Urban Ore including: rocking chairs, vacuum cleaners and parts, optical test equipment, baseball bats, drafting table parts, lamp parts, power tools, safety toes, coffee table, “magic eye” vacuum tubes, neon bar tube, motor, truck tool box, wagon wheel, belt wheels, belts, chain, sprockets, faux ships wheel, fishing reel, etc. Most of these materials were salvaged from the landfill either by being dropped off by customers or by our efforts to divert from the city dump. In a recent interview Nemo states that although he is “not trying to make any sort of environmental statement”, he is “always pleased… that [his] work can be used as an example of the potential value in things we throw away.” We are very proud to help him accomplish this. If you’d like to see this sculpture come to life click here! Many of my Assemblages were created with Urban Ore junk. Look at the Assemblage section in flickr. You will no doubt notice things like the boy mannequin wearing underwear, the Jesus based “Sin Absolver” piece, etc, etc. I also bring decent old lights and a whole set of nice kitchen cabinets – and donate so they won’t be thrown into land fill. I visit 2 – 3 times a week. Geez – almost forgot – Nemo – fantastic piece! wow, that is so beautiful!